Churchill Ports Of Call Kabul by Jeff Banks 3 x casserole dishes with lids. Each dish has a pyrex style lid, each are suitable for oven to tableware and dishwasher proof. Condition is Used. Due to previous experience on Ebay I do not accept any returns or requests for refunds, so please, if you have any questions about the items then please ask before bidding. Items will be dispatched by Royal Mail 2nd class within 48 hours of payment. A SET OF 4 QUEENS 10 1/2" DINNER PLATES IN OUT OF THE BLUE PATTERN INSPIRED BY MARY GILLIATIN VERY GOOD CONDITION WITH SOME LIGHT SIGNS OF USAGE. Lovely Biscuit Jar in the Ports of Call Herat design by Jeff Banks -. As light scratches, marks from use. Great addition to your collection. Churchill Finlandia Soup/Pasta/Dessert Bowls x 6. Six Churchill Finlandia bowls which are suitable for pasta, soup or dessert. They are in a very good condition free of any chips or cracks and with no sign of any utensil wear. The patterns are in good order too. They measure just under 8.75" in diameter. Please note that I take full responsibility for any damage incurred in. Immediate payment required for buy now. Thank you. As light scratches but still look good. Great addition to your collection. Churchill Blue Willow Milk Jug And Sugar bowl. In lovely condition. Milk jug measures approx 11cm handle to spout and 9cm to highest point. Sugar bowl is approx 10cm wide and 4.80cm high. Churchill Chelsea 8"( 20cm.) Side Plates x 6. Set of 3 Churchill Pottery Sheraton Style Salzberg Pattern Mugs NEW NIB ( although dusty from storage). CHURCHILL Ports of Call - Herat Side Plates x 4 The plates measure 6 3/4" in diameter. They are in very good condition with no chips or cracks and light utensil marks. Thank you for looking. Two Churchill Finlandia design soup bowls, made in Staffordshire. Ports of Call - Prague milk jug. 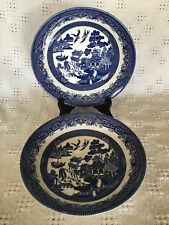 Pair of Churchill Ports of Call pasta bowls 'Kabul'. Excellent condition, only lightly used. Good condition. It is free of cracks, and stains, but may have minor imperfections such as light scratches. There is factory imperfection, looks like chip on the handle. Great addition to your collection. Lovely lidded tureen in the Ports of Call Herat design by Jeff Banks -. Churchill Ports Of Call Zarand 3 x cups and saucers. Cup measures approx 10.25cm wide and 6.50cm tall. Saucer is approx 16cm wide in superb condition. CHURCHILL SHALLOW SOUP BOWLS X 4. ~BLUE WILLOW~. 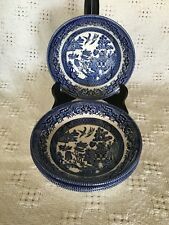 Churchill Staffordshire Blue willlow Soup Bowl 4. Mint.